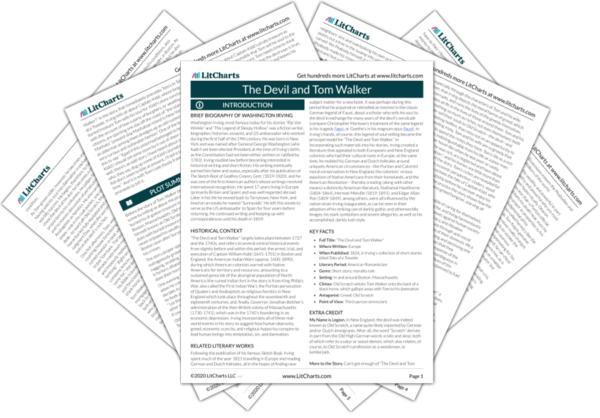 Instant downloads of all 946 LitChart PDFs (including The Devil and Tom Walker). Welcome to the LitCharts study guide on Washington Irving's The Devil and Tom Walker. Created by the original team behind SparkNotes, LitCharts are the world's best literature guides. A concise biography of Washington Irving plus historical and literary context for The Devil and Tom Walker. A quick-reference summary: The Devil and Tom Walker on a single page. In-depth summary and analysis of every of The Devil and Tom Walker. Visual theme-tracking, too. Explanations, analysis, and visualizations of The Devil and Tom Walker's themes. 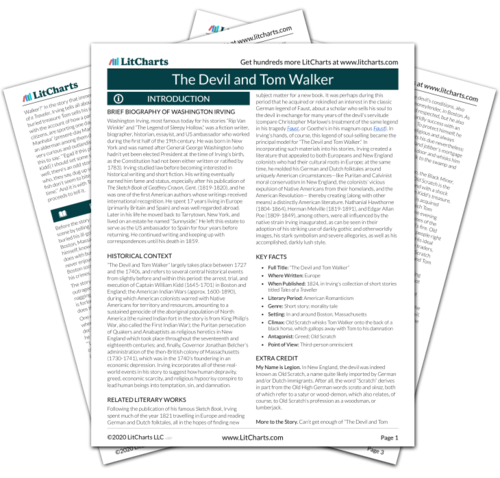 The Devil and Tom Walker's important quotes, sortable by theme, character, or . Description, analysis, and timelines for The Devil and Tom Walker's characters. Explanations of The Devil and Tom Walker's symbols, and tracking of where they appear. An interactive data visualization of The Devil and Tom Walker's plot and themes. Washington Irving, most famous today for his stories “Rip Van Winkle” and “The Legend of Sleepy Hollow,” was a fiction writer, biographer, historian, essayist, and US ambassador who worked during the first half of the 19th century. He was born in New York and was named after General George Washington (who hadn’t yet been elected President at the time of Irving’s birth, as the Constitution had not been either written or ratified by 1783). Irving studied law before becoming interested in historical writing and short fiction. His writing eventually earned him fame and status, especially after his publication of The Sketch Book of Geoffrey Crayon, Gent. (1819-1820), and he was one of the first American authors whose writings received international recognition. He spent 17 years living in Europe (primarily Britain and Spain) and was well regarded abroad. Later in his life he moved back to Tarrytown, New York, and lived on an estate he named “Sunnyside.” He left this estate to serve as the US ambassador to Spain for four years before returning. He continued writing and keeping up with correspondences until his death in 1859. 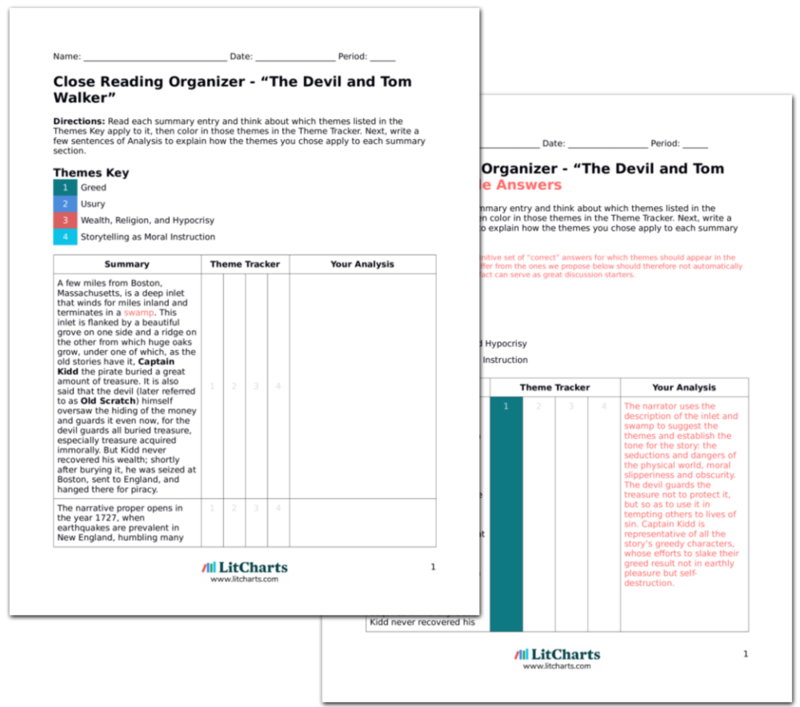 Get the entire Devil and Tom Walker LitChart as a printable PDF. “The Devil and Tom Walker” largely takes place between 1727 and the 1740s, and refers to several central historical events from slightly before and within this period: the arrest, trial, and execution of Captain William Kidd (1645-1701) in Boston and England; the American Indian Wars (approx. 1600-1890), during which American colonists warred with Native Americans for territory and resources, amounting to a sustained genocide of the aboriginal population of North America (the ruined Indian fort in the story is from King Philip’s War, also called the First Indian War); the Puritan persecution of Quakers and Anabaptists as religious heretics in New England which took place throughout the seventeenth and eighteenth centuries; and, finally, Governor Jonathan Belcher’s administration of the then-British colony of Massachusetts (1730-1741), which was in the 1740’s foundering in an economic depression. Irving incorporates all of these real-world events in his story to suggest how human depravity, greed, economic scarcity, and religious hypocrisy conspire to lead human beings into temptation, sin, and damnation. Following the publication of his famous Sketch Book, Irving spent much of the year 1821 travelling in Europe and reading German and Dutch folktales, all in the hopes of finding new subject matter for a new book. It was perhaps during this period that he acquired or rekindled an interest in the classic German legend of Faust, about a scholar who sells his soul to the devil in exchange for many years of the devil’s servitude (compare Christopher Marlowe’s treatment of the same legend in his tragedy Faust, or Goethe’s in his magnum opus Faust). In Irving’s hands, of course, this legend of soul-selling became the principal model for “The Devil and Tom Walker.” In incorporating such materials into his stories, Irving created a literature that appealed to both Europeans and New England colonists who had their cultural roots in Europe; at the same time, he molded his German and Dutch folktales around uniquely American circumstances—like Puritan and Calvinist moral conservatism in New England, the colonists’ vicious expulsion of Native Americans from their homelands, and the American Revolution— thereby creating (along with other means) a distinctly American literature. Nathanial Hawthorne (1804-1864), Herman Melville (1819-1891), and Edgar Allen Poe (1809-1849), among others, were all influenced by the native strain Irving inaugurated, as can be seen in their adoption of his striking use of darkly gothic and otherworldly images, his stark symbolism and severe allegories, as well as his accomplished, darkly lush style. My Name is Legion. In New England, the devil was indeed known as Old Scratch, a name quite likely imported by German and/or Dutch immigrants. After all, the word “Scratch” derives in part from the Old High German words scrato and skraz, both of which refer to a satyr or wood-demon, which also relates, of course, to Old Scratch’s profession as a woodsman, or lumberjack. More to the Story. Can’t get enough of “The Devil and Tom Walker?” In the story that immediately precedes Tom’s in Tales of a Traveler, Irving tells all about Captain Kidd, whose long-buried treasure Tom sells his soul for. Kidd’s story concludes with the account of how a party of burghers, or wealthy citizens, are sporting one day off the coast of “the island of Manhata” (present-day Manhattan Island in New York), when an alderman among them dredges up an old rusted pistol “of very curious and outlandish fashion.” One of the burghers has this to say: “‘Egad if this pistol had belonged to him [Captain Kidd] I should set some store by it out of sheer curiosity. Ah, well, there’s an odd story I have heard about one Tom Walker, who, they say, dug up some of Kidd’s buried money; and as the fish don’t seem to bite at present, I’ll tell it to you to pass away time.’” And it is with Tom’s tale thusly framed that Irving proceeds to tell it. Wilson, Joshua. "The Devil and Tom Walker." LitCharts. LitCharts LLC, 3 Aug 2015. Web. 24 Apr 2019. Wilson, Joshua. "The Devil and Tom Walker." LitCharts LLC, August 3, 2015. Retrieved April 24, 2019. https://www.litcharts.com/lit/the-devil-and-tom-walker.